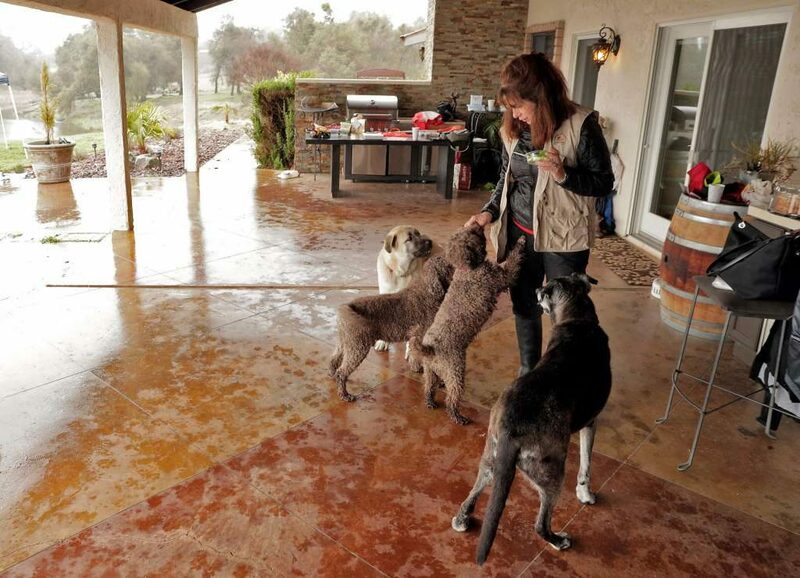 In Placerville, Alana McGee trains dogs bred for centuries to sniff out the luxury ingredient. The hunt for black gold: is California the world’s next truffle hotspot? Staci O’Toole is lying face down in the dirt. “I can smell it!” she cries, nose to the roots of a hazelnut tree. 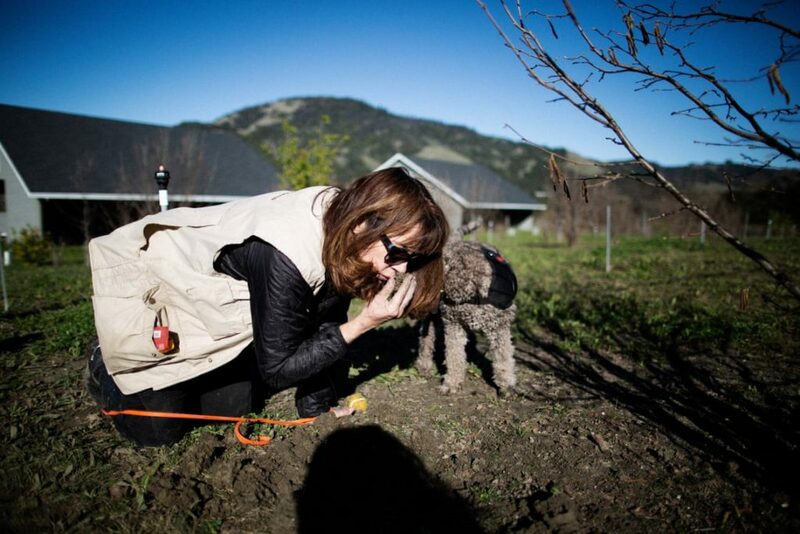 A funky, fungal odor emanates from a shallow hole in the ground of this Sonoma Valley orchard. It hints at a hidden treasure many years in the making: a French Périgord truffle, grown right here in California. 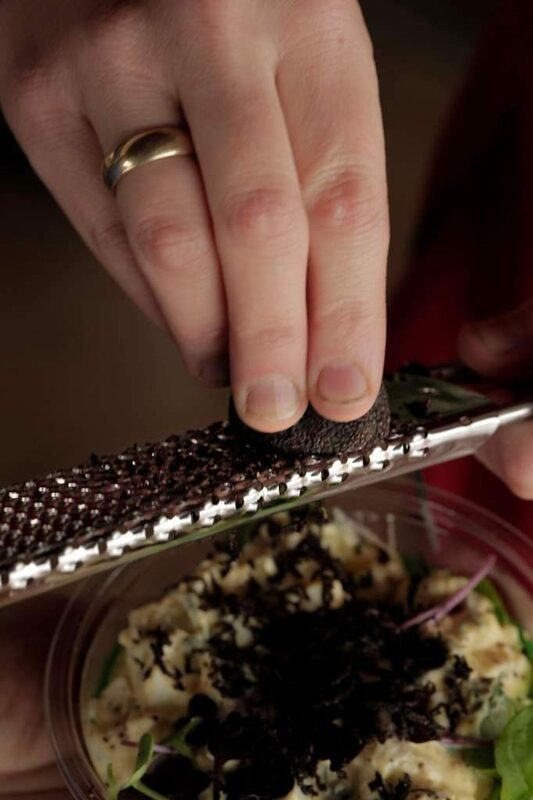 Commonly known as black truffles or even black diamonds, Périgords are one of the world’s most sought-after delicacies, selling for $800 or more per pound. Revered for lending an intoxicating flavor to everything from tagliatelle to sushi, they remain widely adored and shrouded in mystery. With wild truffles increasingly scarce, scenes of affable farmers trawling the woods with a pot-bellied pig are becoming a rare sight. Most black truffles these days come from farms, where they are hunted by specially trained dogs. Cultivation secrets in this lucrative industry have traditionally been closely guarded, with the market dominated by France, Italy and Spain. But in recent years New World upstarts have been gaining ground: Australia isexpected to produce 15 metric tons this year, while New Zealand, South Africa and Chile all have burgeoning industries. For decades many have pinned their hopes on the Mediterranean climate, robust wine industry and thriving food scene of California as the world’s next truffle hotspot. Now, it appears, such hopes are paying off. On this bright winter day, O’Toole, AKA the Truffle Huntress, has brought her pedigree truffle dogs to survey a property in the heart of northern California’s wine country. 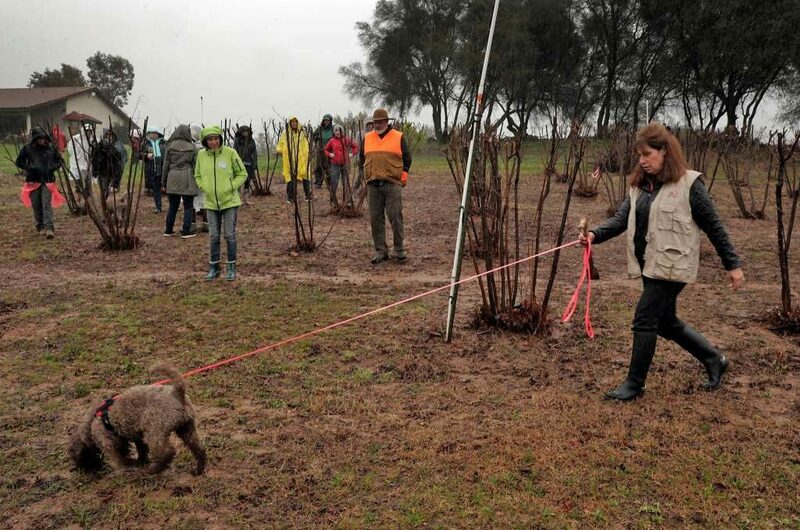 Mila, the more experienced of the lagotto Romagnolo dogs, is leading the charge. Panettone, still in training, bounds close behind. The pair survey the orchard with enthusiasm and ruthless efficiency: several quick sniffs at the base of a tree are enough to determine whether a truffle lurks beneath. They comb several rows of trees without luck before Mila pounces and paws at the ground: the sign to start digging. Wearing knee-high wellies and oversized sunglasses, O’Toole uses a delicate truffle trowel, a tool that looks more like a blunt dagger than a shovel, to turn the soil, occasionally lowering herself to the ground to sniff at her progress. “I can tell if I’ve got something here because it will make my mouth start watering,” she explains, brimming with optimism. Truffles can take up to 10 years to produce, and growing them is like farming in the dark: fiddling at the surface in the hopes something magic is taking root below. O’Toole came to truffle hunting after a career as a health insurance executive living in Silicon Valley. She wasn’t ready to retire but wasn’t sure what to do next. Turned out her dog held the key. 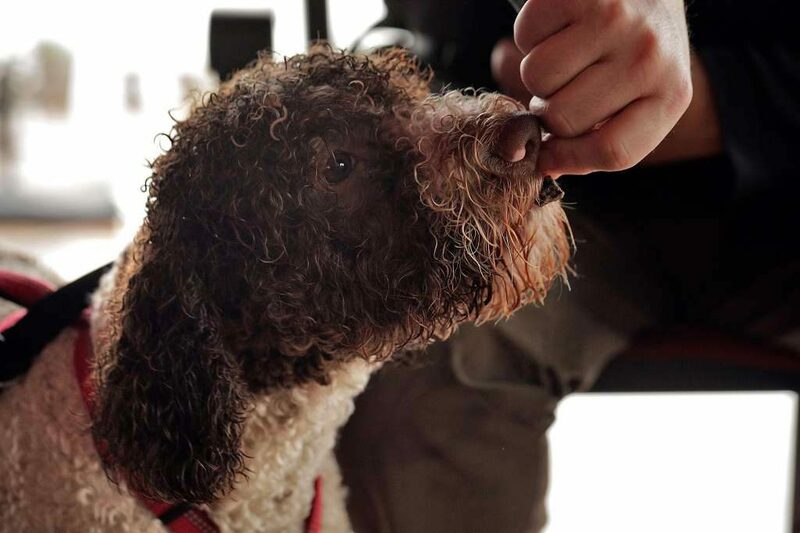 The lagotto Romagnolo is a traditional Italian truffle hunting breedso attuned to its craft that, when she bought Mila from the breeder, they made her promise she would train it up properly. Mila was a natural, finding her first truffle at just 12 weeks old. O’Toole now works as a hunter on various orchards while running her own farm, which this year harvested almost 2lb. While walking dogs with her friends six years ago, Staci O’Toole and the other ladies fantasized about the perfect job. They joked that it would have to involve dogs, of course, plus wine, food and being outdoors. Months later, O’Toole was in the market for a dog, Googled the criteria she sought, and two breeds popped up: the Tibetan Terrier, a herding dog, and the Lagotto Romagnolo, Italy’s truffle hunter. Herding sparked no interest, but the idea of training a cute, curly mutt to hunt truffles, then to enjoy found fungi with wine and food had O’Toole’s imagination running wild. 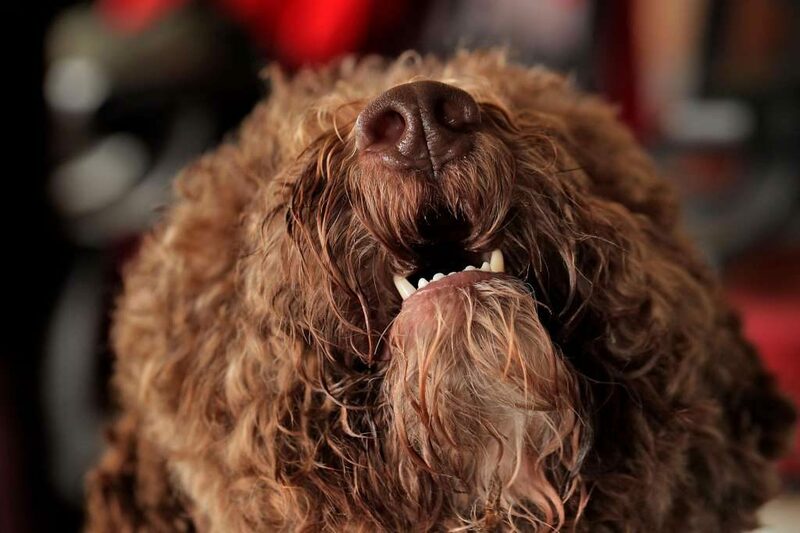 A Lagotto would be her next pooch. O’Toole called a breeder, but was disappointed to learn there was a two-year waiting list for a puppy. Not only were Lagottos great at finding truffles, but they’re exceptional family dogs, don’t shed, are hypoallergenic, intelligent, have a good disposition, are compact, endearing and want to please. 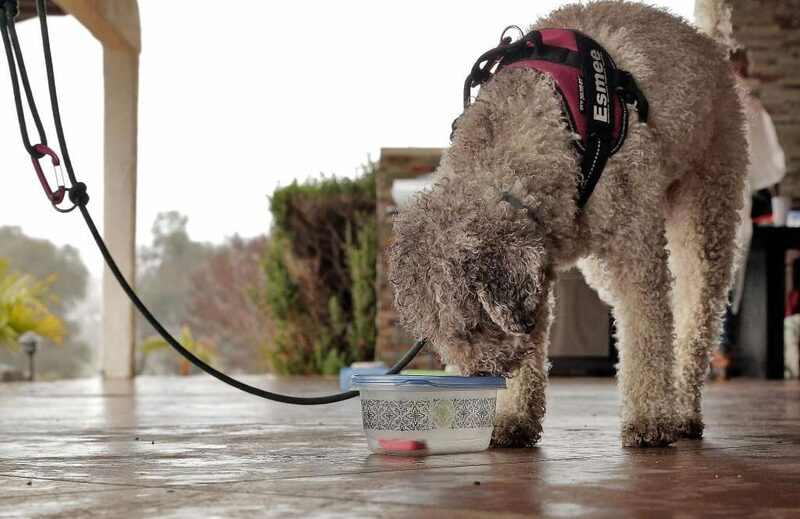 The breeder recognized that O’Toole was looking for a working dog, one that would be driven to search for truffles, a trait not desirable in show or companion dogs. 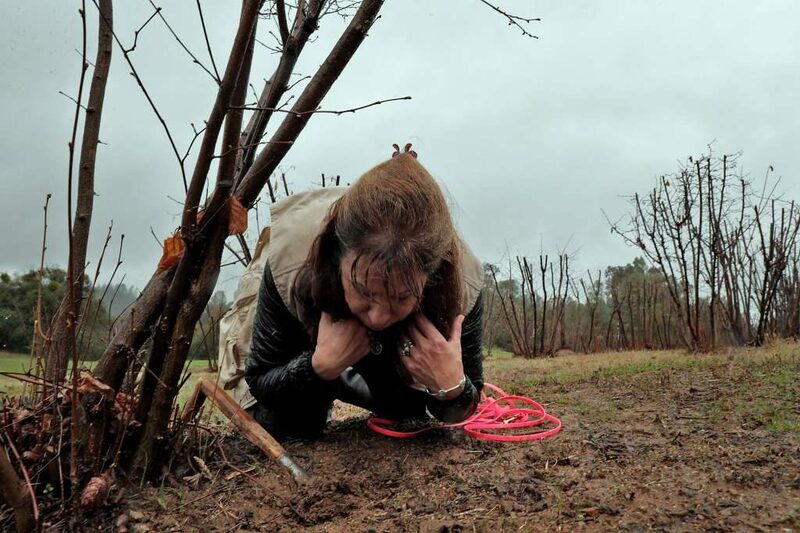 Working dogs are hard to place, often being returned by owners who can’t handle their obsession to find truffles. So, he promised to contact her should a working dog become available. 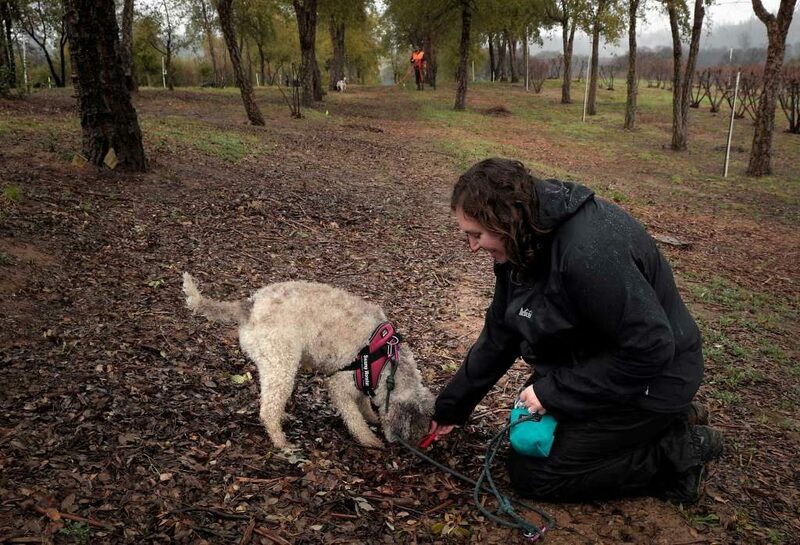 Four months later, O’Toole had her first Lagotto puppy and soon learned of a truffle dog training session being held at the Oregon Truffle Festival in Eugene. She took 12-week-old Mila to the festival but was told not to expect much from a dog so young. 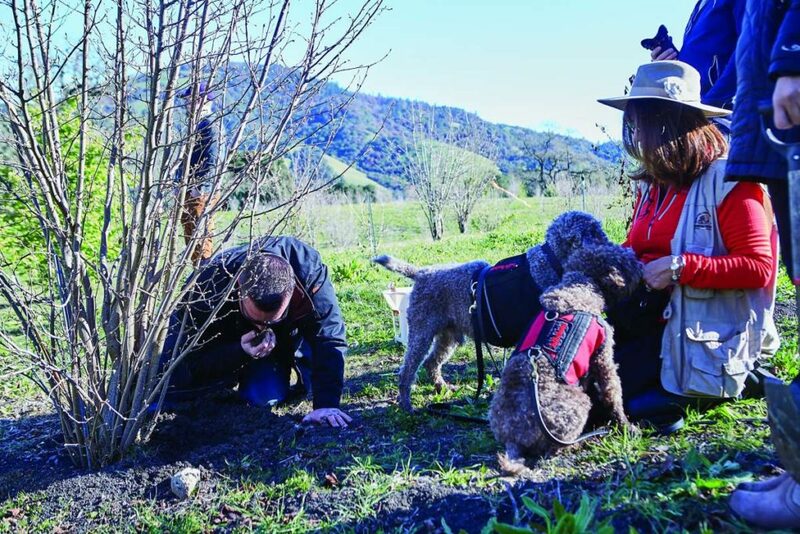 Soon, O’Toole and her Lagotto were being called to Sonoma and Mendocino County truffle orchards on weekends, creating the fantasy job she and her friends had imagined. 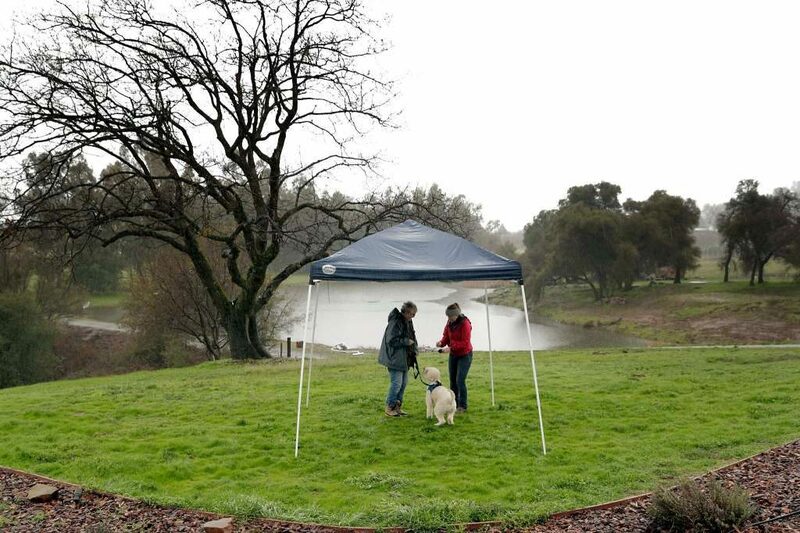 O’Toole and Mila would follow truffle hunting with good wine, food and truffle talk, hosted by wineries and farms with truffle orchards. It was a dream, come true. For decades, enthusiasts have hoped truffles can follow wine’s path to success in the state. 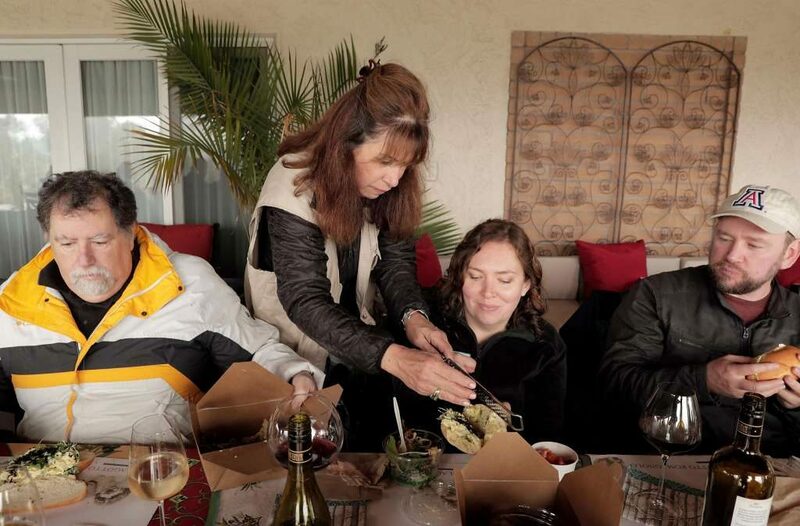 So far this winter, a farm in Placerville (El Dorado County) has found 1 pound of prized, elusive black truffles, leading to its first sale to a Northern California restaurant on New Year’s Eve. Around the same time, a 10-year-old Santa Rosa orchard also found its first truffle. Meanwhile, a nearby Santa Rosa orchard owned by Jackson Family Wines has unearthed an astonishing 25 pounds of truffles this season, some of which are being served in San Francisco restaurants like Saison, Birdsong and Che Fico. About a decade ago, California-grown black or Périgord truffles were at best a dream, and at worst a long shot. That’s when about a dozen farmers started planting orchards of hazelnut and oak trees, their roots inoculated with Tuber melanosporum spores. If the orchard was carefully tended, the first black truffles could form within five to eight years, though it would take a couple more years for an orchard to really bear fruit. Growing truffle is a relatively new thing in California, but last year’s harvest happened around this time. Most truffle is imported from France or Italy, but a few years ago Staci O’Toole bought an orchard in Placerville in hopes to grow truffle in the Golden State. “We have hazelnut trees and Oak. They are really the only trees in nature that have truffles,” said O’Toole. The orchard is in the beginning stages of production and in the meantime she runs a business she calls “The Truffle Huntress”. Truffle can sell for upwards of $3,000 a pound. They grow underground and the trees in O’Toole’s orchard were inoculated with truffle spores when they were planted. It takes about seven to 10 years for the trees to mature and the truffle to grow. To harvest the mushroom, O’Toole uses a pair of Logotto Romagnolo’s, which are dogs that are specially bred to sniff out truffle. “Some hunters used to use pigs to find truffle. The problem with pigs, they tear up the ground and the roots,” said O’Toole. There is only a handful of truffle orchards in the United States and harvest is kind of sporadic. “We are not really sure when truffle season is here in Placerville because it’s so new,” said O’Toole. It could be anytime between November and February. 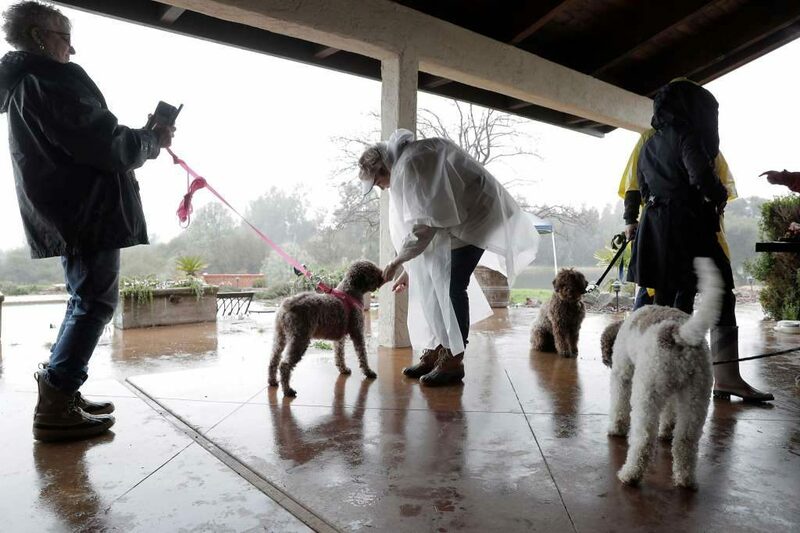 Last December, one of O’Toole’s dogs found a quarter pound of truffle in Sonoma. For the past few years she has been traveling to different truffle orchards and festivals to share her knowledge about truffle hunting. Man Made truffle orchards are starting to take off in places like Oregon and the interest is growing in the Napa Valley. O’Toole’s goal is to train dogs and their owners to find future crops. “Much like the wine industry 60 years ago… this is still experimental we don’t know where it’s going to go,”she said. O’Toole believes someday California will become a competitive producer of truffle. Can a more perfect match be found for the indulgence and excess of ones Thanksgiving Feast? We Americans apparently aren’t the only ones who enjoy a good old stuffed bird as it is the French that took it to a whole new level having dined upon Dinde Truffee centuries ago. According to Brillat-Savarin, the father of French gastronomy, wealthy Parisians were consuming hundreds of Truffle Stuffed Wild Turkeys in the late 1700’s from November to March, coinciding with the Truffle Harvests. The recipe was quite simple 3-4 lbs of truffles poached in lard stuffed into the turkey with truffle slices slipped under the skin for good measure. The bird was to sit for a couple days to infuse the flavor and then wrapped in fat and roasted (bard). At today’s going rate of up to $2,000lb for Alba White Truffles(T. Magnatum) it would be surprising if Truffled Wild Turkeys were available for anyone! Apparently the Coyotes at the ranch didn’t get the message… whilst traipsing through the truffiere several weeks ago trying to ascertain the ripening of the Perigords under foot, the Truffle Huntress and I came upon what appeared to be very limited remnants of one of the resident wild turkeys. A few long tail feathers and a half dollar size of skin with a few pin feathers was all that remained. It certainly explained the ruckus we had heard the night before coming from what seemed to be right outside the door. It was actually quite frightening as it was nothing like we had heard before; the yips and howls that we hear nightly in the distance. It apparently was a full on feeding frenzy with growling, shrieking, crying and screaming that lasted for only about a minute but seemed like twenty as it sent shivers down my spine as they finished off their kill. I hadn’t contemplated that we could have a resident pack on premises and it got me thinking…. Were those damn Turkeys scratching up and eating the truffles from our Tesoro Mio? I had seem them in the truffiere previously and they had even left their calling card of scratching marks and small divots but I had assumed that they were eating the hazelnuts from the truffle trees, snails and unwelcomed insects and had considered them friend. Could it be possible that they were instead infusing themselves with truffles albeit immature?? As expected the sightings of wilds turkeys become scarce prior to the preparation for the holiday feast. I wont have a chance to test the hypothesis this year but have put the wheels in motion to make sure we have it all figured out in the weeks and months to come. As for the Truffled Wild Turkey, I am hoping that I will have the opportunity to try the Dinde Truffee next year stuffed with Tesoro Mio Perigords. In the meantime I have found a great website to order fresh wild turkeys and truffle butter for a lighter version of Dinde Truffe. I’ll let you know how it goes and you let me know if your interested in learning more about the website. Wishing you the bounty of the season!